Blackjack, (or as it is better known, 21) is one of the most popular and widely played online casino games in the world. The first written reference to the game is in a short story by the author of Don Quixote, Miguel de Cervantes in 1601-2. Other later popularisations of Blackjack are believed have occurred in France in the 17th century and later again in Spain in the 18th century. In the early 19th century, Blackjack arrived in Canada and the US with a large number of French immigrants, and quickly spread to gambling parlours, saloons and bars, before becoming a staple and favourite game of land-based casinos. Today, it´s considered the most popular online casino game in the world, and it is available in several different variations. Our online Blackjack guide will explain how to play, the rules and strategy of the game and we’ll look at the most common Blackjack variations that are available in quality online casinos. Blackjack is a relatively simple card game in which you are trying to beat the dealer by scoring closer to 21(Blackjack). The catch is that you cannot ‘bust’ and your hand cannot exceed the value of 21 or you automatically lose the round. Blackjack is a card game played against the house. In a land-based casino, you would be playing against a dealer, or against the computer if you are playing online. One reason why Blackjack is so incredibly popular is that the odds against the house are great and you have the potential opportunity to win some serious cash if you learn how to play well! Blackjack is most often played with 6 to 8 52-card decks, although some variations use 1 deck or 48-card Spanish decks. Accordingly, the number of variations of Blackjack is seemingly endless. Ignoring the multitude of tweaked versions of the game, the first step to play winning blackjack is to familiarise yourself with the rules of the classic version, which we will go through extensively. Hit – If you want another card from the Dealer to try and get you closer to 21, you ‘Hit’. Stand – To stick with the cards you’re dealt, you ‘Stand’. Double Down – The player has the option to double his initial bet in exchange for receiving one, and only one, more card. Split – The player is allowed to split a hand comprised of two cards of equal value into two hands. The player then continues playing the hands separately. Insurance – If the dealers face up card is an ace, the player can insure against the dealer having a blackjack, by placing a side bet called insurance. The insurance payout is 2-1, so if the player wagers as much on insurance as the initial bet, he breaks even if the dealer has blackjack. Surrender – Some games offer the option for the player to surrender as their first action, in the case that the dealers face up card is a 10 or an ace. If the player chooses to surrender, he will get half his wager back. This rule is very uncommon occurrence in online Blackjack. In Online Blackjack, a hand of blackjack begins with a player making an initial bet before receiving their cards. Then you click Deal, and the computer will deal two cards, face up, for the players and then two cards for the dealer, one face up and on face down (the dealers face down card is often referred to as a hole card). Once the cards are on the table, the player opts to either hit or stay depending on how close the value of their cards are to 21. Very important, so we will repeat it again: the player who goes over 21, busts and automatically lose the hand and the bet. The goal in Blackjack 21 is to beat the dealer. A Player beats the dealer by getting a total card value as close as possible to 21 without “going bust”, meaning going over 21, and either outscore the dealer or have the dealer go bust. All face cards have a card value of 10, all others have their normal numerical value. Aces can be counted as either 1 or 11. The best possible hand you can get is Blackjack, a two-card combination with the value of 21, consisting of an Ace and a face card. Blackjack beats 21 other combinations. Once you have received your two cards, you may decide whether to ‘Stand’ or to ‘Hit’. Standing means you are satisfied with the hand you’ve been dealt, either because you reached 21, or because you deem the risk to be too high of going bust if you take another card. ‘Hit’ means asking the dealer for another card. You can take as many cards as you want, until you are satisfied or go bust. If you go bust, you lose your bet and the game starts anew. Once you have chosen to stand, it´s the dealers turn to play his cards, starting with the face down card. The dealer will hit on 16 and stand on 17. In some games, the dealer must hit on a “soft 17”. This is a card combination with a value of 17, where an ace is counted as 11. If you lose the hand, you lose your bet. If you win, the payout is 2-1, except for a Blackjack win hand, that pays 3-2. Open a Blackjack table by selecting the Blackjack button in the lobby of your chosen online casino. Your chips will be stacked, usually in the right-side of the table window. Select the amount you want to wager on any given hand by clicking on a chip of that denomination. Similarly, you can decrease the amount wagered by clicking on the ‘Bet’ stack. Once the wager is placed, click on the ‘Deal’ button. The ‘Deal’ button will be activated only if a wager amount equal to, or more than the minimum bet amount has been wagered. The dealer deals two cards face up to you and also deals two cards to himself. The first is dealt face up and the other face down. Depending on the strength of your (the player’s) cards, you can choose one of the several options we outlined above that are determined by the games rules; ‘Hit’, ‘Stand’, ‘Double’, ‘Split’ or ‘Surrender’. The dealer checks for Blackjack before you draw your third card. The ‘Insurance’ option is offered to the player in case the dealer has an ace as his first card. Once you (or the dealer) stands or busts, the results are displayed on screen, usually just above the ‘deal’ button. To continue the game with the same bet, click on ‘Repeat bet’ button. To clear the game and place a new bet, click on ‘Clear’. To place a new bet, click on the desired chip denomination. Your current game balance is always displayed on screen. If you exhaust all of your available balance and have no credit remaining, click on ‘Rebuy’, followed by the $ button to add more funds to your real money account. Click on ‘Rules’ for all Blackjack rules. Most online Blackjack games have a ‘Game Log’ where you can review previously played games to help develop and analyse your strategies. The simplest way to win at blackjack is to follow a strategy chart. Strategy charts demonstrate three different elements: the dealer’s face-up card, your hand, and the action you should take. Knowing when to stand, hit or double down isn’t the easiest decision to make for an inexperienced player, even if you have a keen mathematical mind for assessing probabilities. Pure brain and will power will not lower the house edge. The Blackjack Basic Strategy, however, will. If you play according the strategy in the chart below, you will actually lower the house edge to as low as 0.5%. 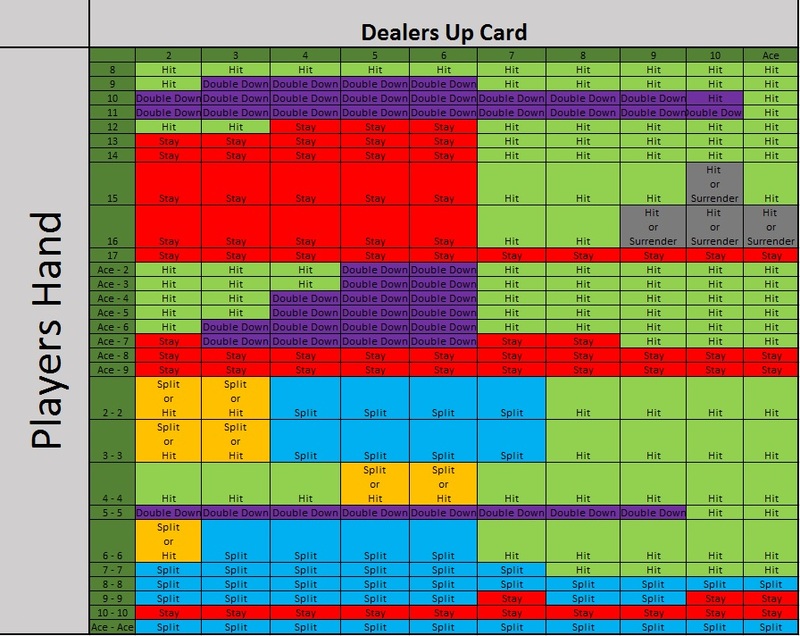 The chart tells you exactly what to do for every possible combination of player and dealer hands. With the added benefit of playing online, you can take as much time as you want. Print out the chart out below or have the link opened in another tab to have it beside you when you play Blackjack online. Depending on if you have a soft hand, where your Ace is valued at 11, a hard hand where your Ace is valued at 1, or pairs then you would need to use a different table. Keep in mind that a hand with no Ace is always considered a ‘hard hand’. Open up a new tab, start an online blackjack game, and use this chart as a grid to assess the best play for any possible hand. Practice makes perfect – Playing blackjack online is no exception to the rule. Most online casinos nowadays offer you the opportunity to try out their online casino games for free. Playing for free is the perfect way to learn the rules, as well as try out the different versions and to research the version that suits your personality and style. Beating the dealer has a payout of 1:1 whilst a natural Blackjack has a payout of 3:2. Learning and mastering a good blackjack strategy can cut the house edge to as little as 0.5%. Always double down on a 10 or on an 11-value ace. Always split your Aces and 8’s to give yourself a better chance of winning. Never take Insurance – It may seem like a good idea to take insurance when faced with the risk that the dealer sits on a Blackjack. However, this risk isn’t more than 30%. It´s simply not a mathematically sound decision to take insurance. Keep bankroll and rent money separate – It is important to keep your gaming money separate from your “regular” money that you use for everyday life expenses such as housing, food, clothes and buying my books. Set up an account strictly for your Blackjack funds. Never use money other than from this fund for playing. As an extra layer of financial security, money should be divided using the concept of session stake, daily stake, weekly, monthly or annual stake. American Blackjack – In American Blackjack, you can only double down on your bet if the first two cards totals 10 or 11. European Blackjack – In European Blackjack you may be allowed to double down on 9. These restrictions raise the house edge over the player slightly. Double Exposure – The dealer’s cards are dealt face up. This should give an edge to the player, but it doesn’t, the edge returns to the house. The house cleverly compensates for this in two ways. In traditional Blackjack, when the dealer and player tie, (also called a “push”) the player keeps his wager. In this version, it means the player loses. In Double Exposure, Blackjack only pays 2-1 instead of 3-2, making the house edge even higher than traditional Blackjack. Choosing your favourite online Blackjack game isn’t an easy task, but we hope the options outlined in this guide have given you some inspiration to have fun with. Encompassing the key features of online Blackjack games, our guide should give you everything you need to choose a good online casino that suits your personality. A good casino should offer as many Blackjack versions as possible. These include Live Dealer Blackjack, American and European Blackjack. Why not try out the many different online Blackjack game options at great online casinos like Spin Palace, Ruby Fortune, Betway, Royal Vegas, Jackpot City and William Hill. Good luck! “Two for the Money” – Best Sports Betting Movie Ever?